Giveaway Time! Win a Copy of SBSH PhoneWeaver 2! "SBSH Mobile Software is excited to announce today the PhoneWeaver for Windows Mobile Touch major update to version 2! 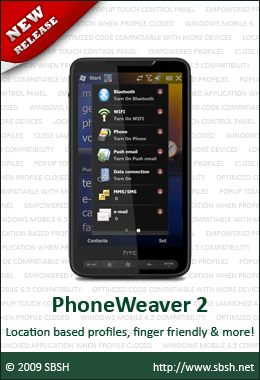 SBSH PhoneWeaver 2 for Windows Mobile Touch is a robust profiles and phone management tool designed to fill one of the greatest needs of Windows Mobile users - enjoying powerful, smart and automated profiles! Additionally, PhoneWeaver brings a mobile-optimized interface for complete phone radios management with a touch of a finger! PhoneWeaver 2 introduce new location-based profiles to activate profiles automatically while you're on the move; touch designed profiles control panel that helps you switch between profiles with a touch of a finger and much more!" Last week, much to the elation of many PhoneWeaver users, SBSH released v2 of the aforementioned phone management tool. The major upgrade adds a handful of new and improved features such as a touch-friendly phone control panel, location-based profiles, extended profile functionality, and Windows Mobile 6.5 optimizations. And thanks to SBSH, we have five copies to give away here at Windows Phone Thoughts. So what do you have to do to win? Read on and get commenting. Good luck! Leave a comment in this thread, stating the phone you currently use. If you don't have one, feel free to mention the phone you're hoping to get this holiday season. Entries will be accepted until 11:59 PM GMT on January 6, 2010. A total of five winners will be selected randomly and notified via e-mail, so please ensure that a valid e-mail address is linked to your Thoughts Media account. Each winner will receive a single licensed copy of PhoneWeaver 2. Last edited by Theo; 12-23-2009 at 12:57 PM.. Currently the Sprint HTC Touch. Would like the HTC Touch HD2. HTC Touch HD2 - fantastic, so much better than old HTC Touch Dual, but now need new profile manager as used to use competitor product which isn't touch friendly. But could do with the settings on PhoneWeaver 2 being more touch friendly, some of those are hard to select with the HD2. Fantastic phone tho. HTC Touch on Sprint currently. Waiting to see where the HD2 lands next year. I may have to switch carriers. I have been a long time Windows Mobile (and all its earlier names) user, but have been on Blackberry for the past two years. I recently converted back to Windows Mobile on a HTC Touch Pro 2 (actually an unlocked and flashed AT&T Tilt 2). I really like this device alot and will probably go to the HTC HD2 when it is available in North America. The blackberry had superior sound profile capabilities so an improvement in this area from SBSH should be very popular! This would be great on my Omnia i910 running WM 6.5!